AIZAWL, Sept 30: It was a tearful moment for Congress legislator Lalrinliana Sailo as he made his farewell tour to Tuichang constituency during the last two days, after he decided to call it quits. 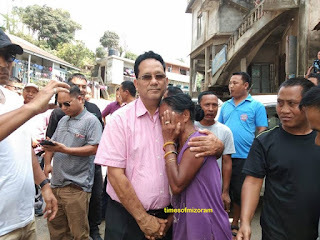 Sailo’s discontent with the Congress leadership culminated into his decision to leave the party which he made it crystal clear on Saturday during his tour to his native village Khawhai, the second biggest village in his constituency that he has been representing for three consecutive terms. The Health Minister in the previous Congress government threw in the towel as he sensed the wind was blowing in favour of opposition Mizo National Front (MNF) candidate Tawnluia in his constituency who he felt “holds the trump card” with the MNF promising to implement Khawzawl district. Khawzawl is the largest town in Tuichang constituency. The subdivisional town was upgraded to a district headquarters by the then MNF Government in the late 2008, a few months before the State Assembly polls, along with two other towns – Saitual and Hnahthial. The successive Congress Governments refused to implement the district citing financial constraints. “Now that MNF has promised to implement Khawzawl district, which is the unfulfilled aspiration of the people of my constituency, the wind blows in favour of MNF candidate. Now, there is nothing left for me than to go back to Aizawl and tender my resignation as MLA and from Congress party,” he said. Sailo also mentioned that he had already been “removed” from Congress legislature party and that the party high command was looking for someone else to contest from Tuichang constituency on Congress ticket. Even though Sailo said he would later decide his future course, insiders in MNF have said that he would contest from Chalfilh constituency on the party’s ticket. He also indicated that he is joining MNF as he appealed the people during a public rally at Khawzawl on Saturday to vote for the MNF candidate. “You will do me a favour when you vote for the MNF candidate,” he said. The second most important person in the Lal Thanhawla Cabinet and Congress vice president R Lalzirliana had resigned and was subsequently expelled from the party.